Meat-and-Potatoes-Guy and I just returned from a trip to Hawaii and arrived home to several days worth of very damp, very chilly, extremely rain-filled Boston weather. Not wanting post-vacation blues to set in, I had just the thing for the change in climate: steaming, heart-warming bowls of ragù pasta! 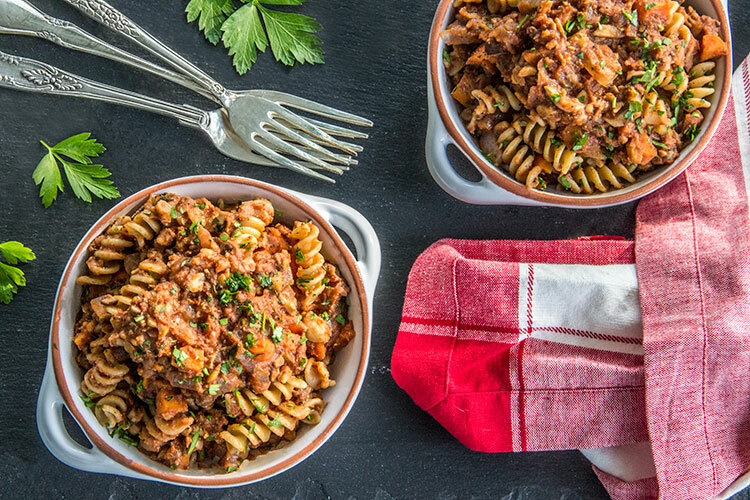 Ragù is traditionally a meat sauce served over pasta, but this version is unique because it’s vegan and made with a tasty combo of veggies and beans. 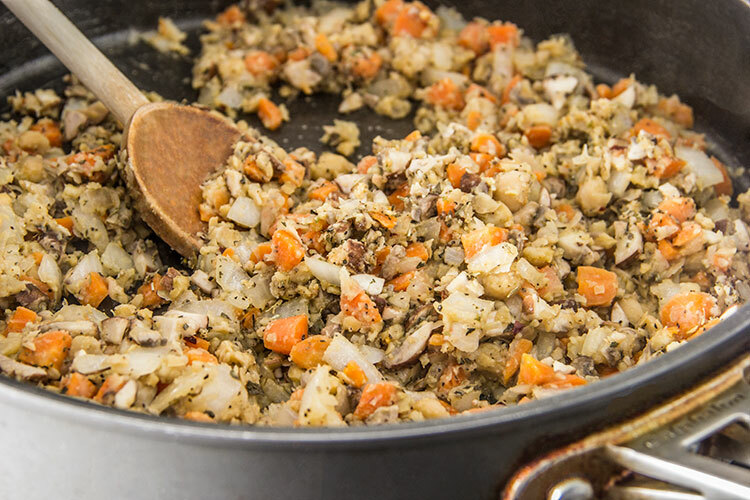 With mushrooms, carrots, and chopped chickpeas, the texture of this “meat-less sauce” is rich and thick and mimics the consistency of a traditional meat sauce. 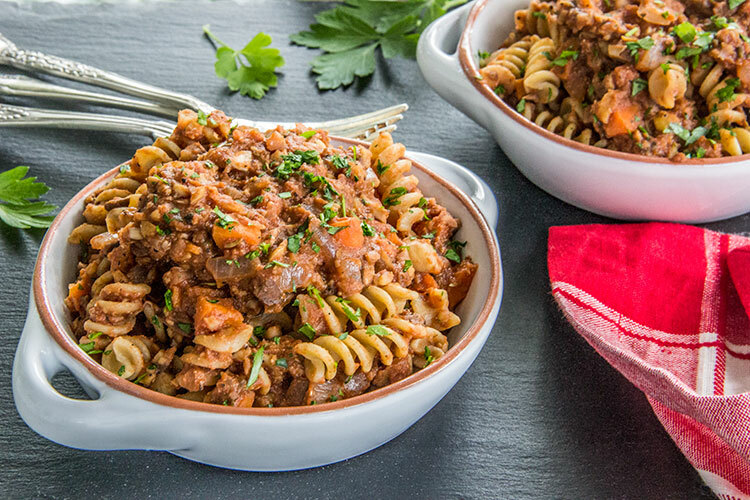 It’s hearty, really satisfying, full of flavor, and even looks like a traditional meat sauce! Best part: this pasta dinner is a complete meal that’s easy to whip together in about 25 minutes (my favorite kind of recipe)! 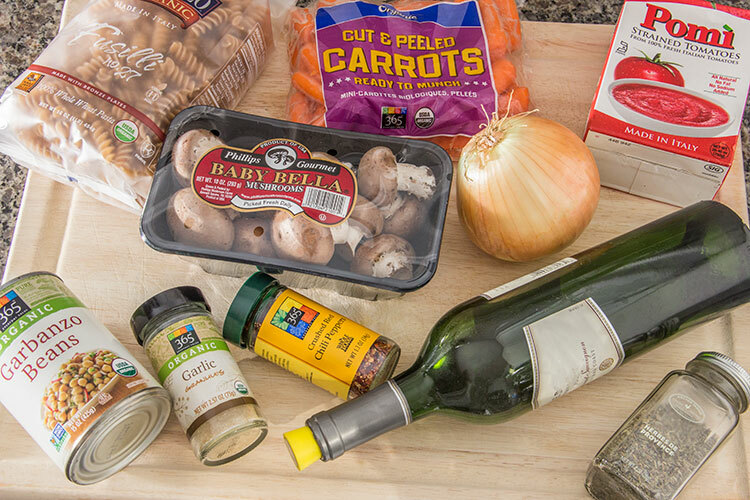 Get the complete, printable recipe for Meatless Chickpea Ragù at Food Fanatic. 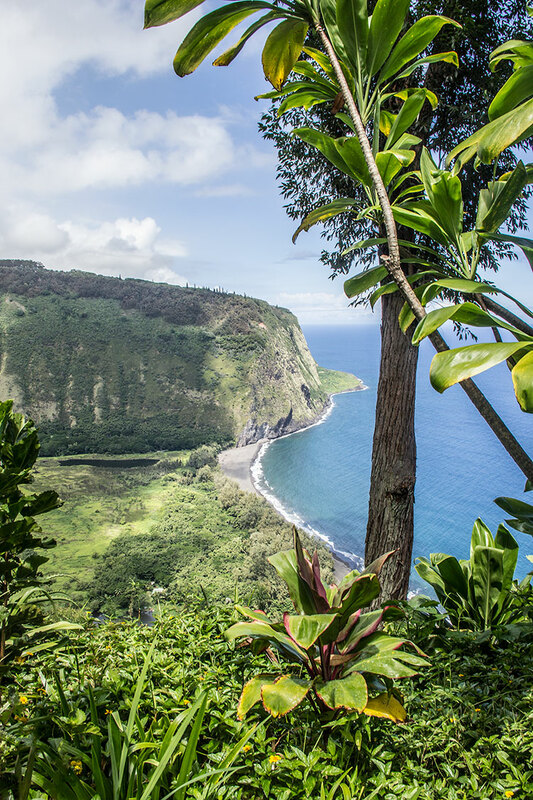 Step-by-step instructions for the recipe are below, but first, I’ve got to share a few photos of breathtaking Hawaii! 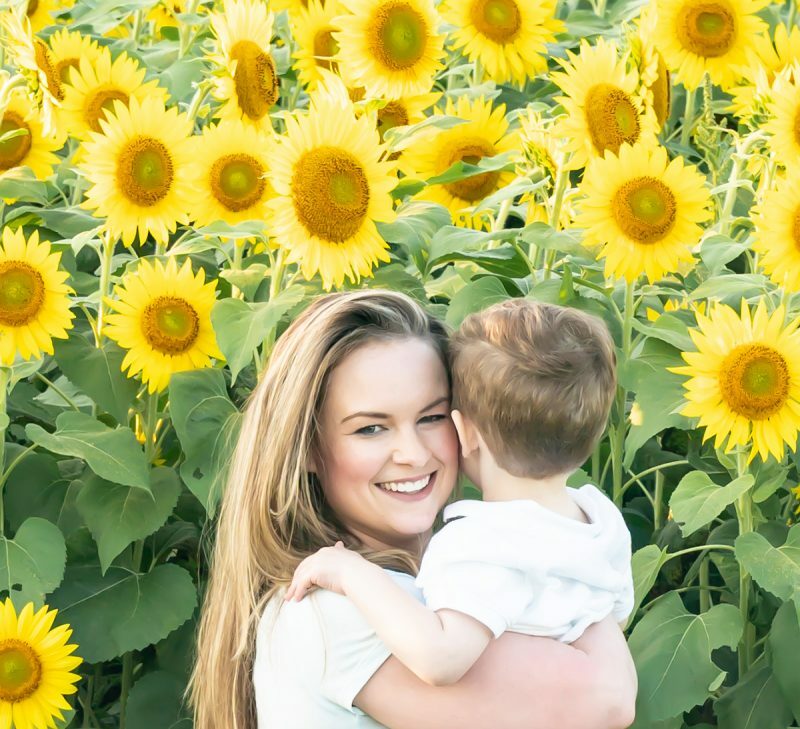 I questioned whether this destination would be worth the 13 hours of flying time it takes to get to Hawaii from Boston (and then the additional 13 hours to get back home! ), but, yes, the travel was worth it. 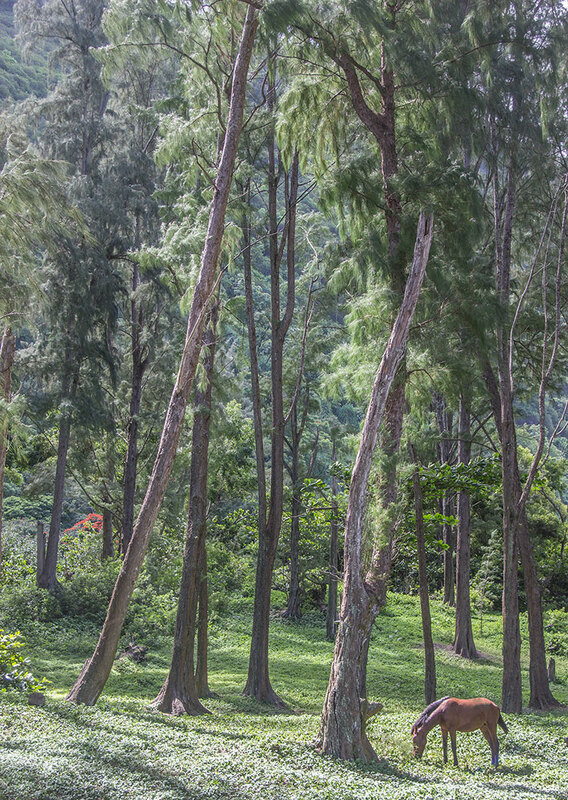 This is Waipi’o Valley, located on Hawai’i Island (the Big Island). 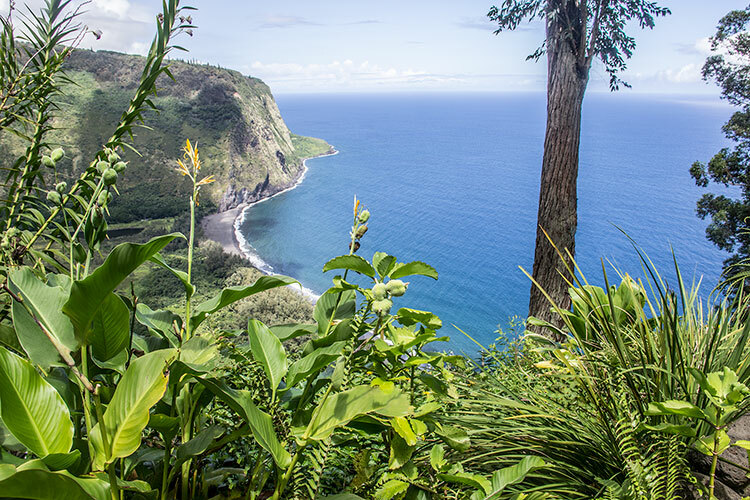 The view from the lookout is incredible! 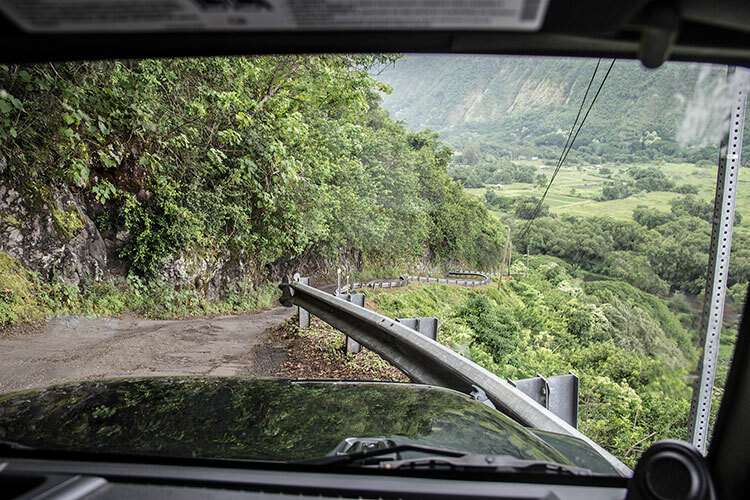 You can make a harrowing trip down to the black sand beach only if you’ve rented a 4-wheel drive vehicle – it’s a very narrow, very steep, very bumpy, unpaved road! 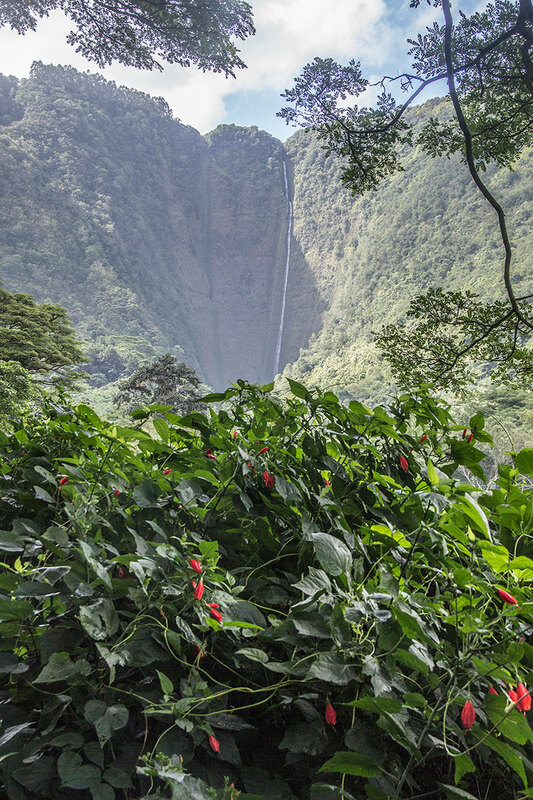 But the tough ride down to the valley is worth it – there are enormous waterfalls to see. 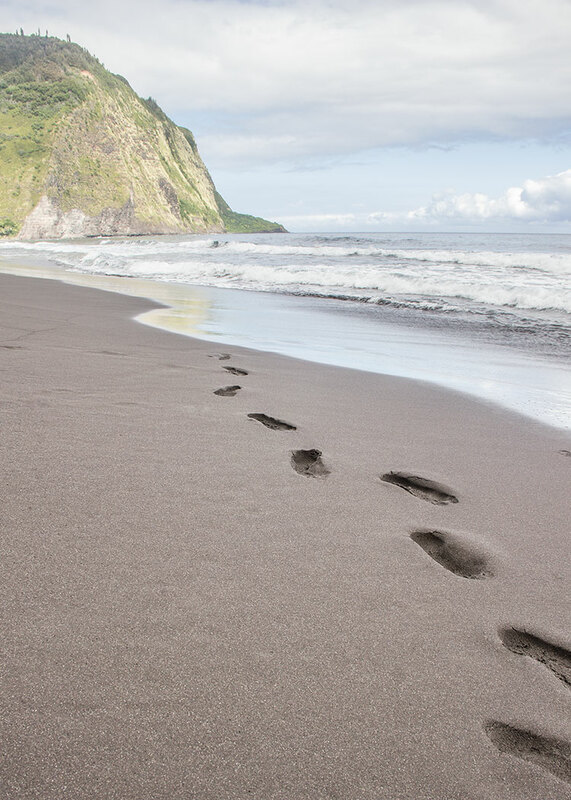 And a black sand shore that feels like your own private beach. 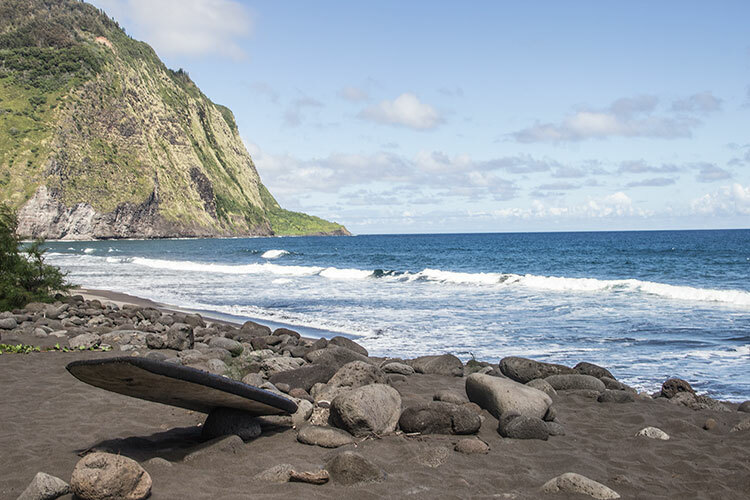 (I was told that, like all beaches in Hawaii, it’s public, but not a lot of people attempt the trip down!). 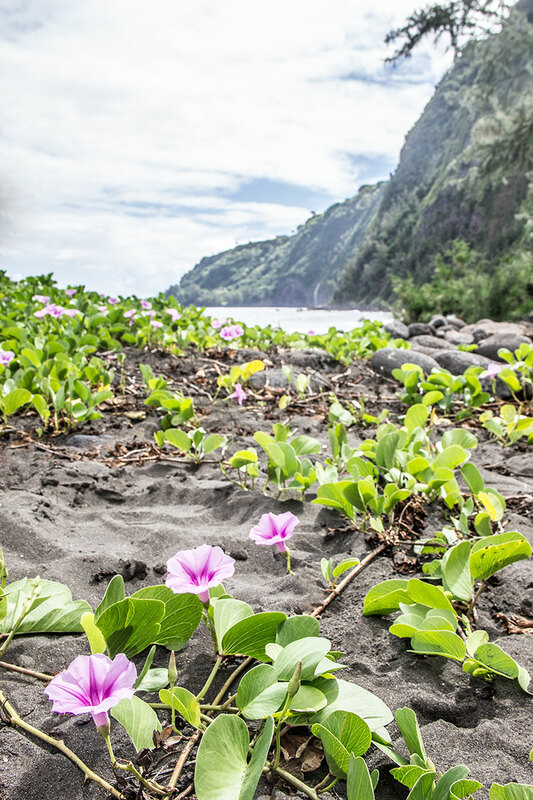 Tropical flowers grow right on the sand. 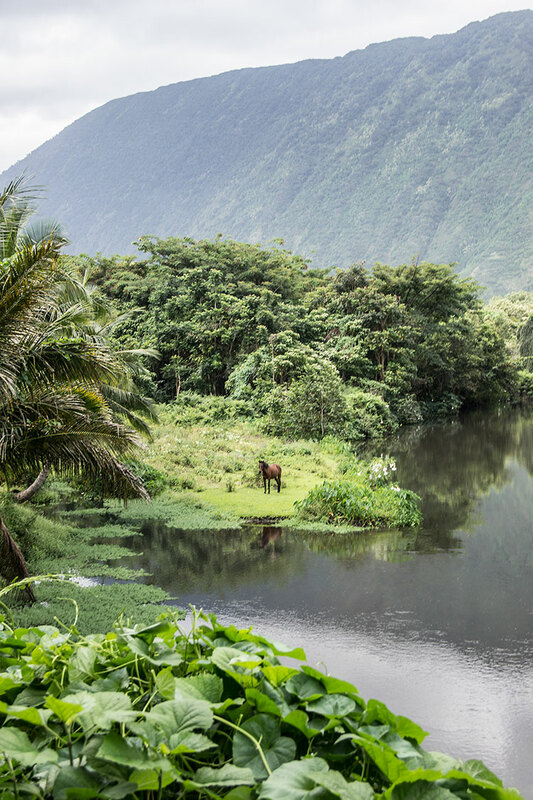 And my favorite part of Waipio: wild horses live here! The sweet horses were really calm and mild-mannered and allowed me to approach them closely for photos. … and a few carrots. Also chop some crimini mushrooms. Boil a large pot of water, season with salt, and toss in some whole wheat fusilli or penne pasta. Cook until the pasta is just al dente, and drain. 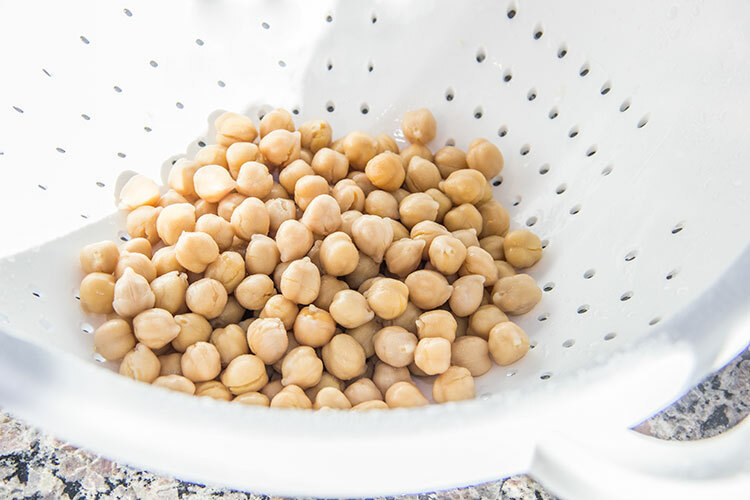 Meanwhile, as the pasta is cooking away, drain and thoroughly rinse some garbanzo beans (chickpeas). 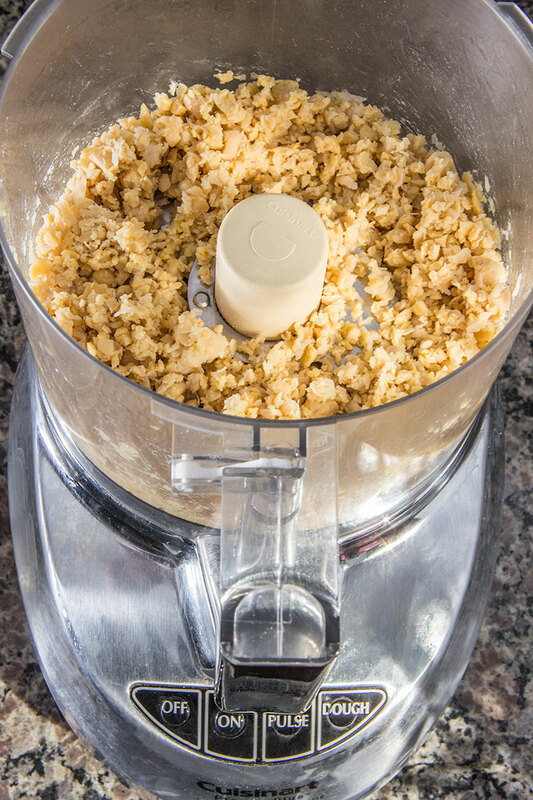 Pour them into a blender or food processor. For the best texture for the sauce, pulse only a few times, just until the beans are roughly chopped. Slightly chopping up the beans mimics the consistency of ground beef in a traditional ragù. Next, heat a bit of olive oil in a large sauté pan over medium heat. 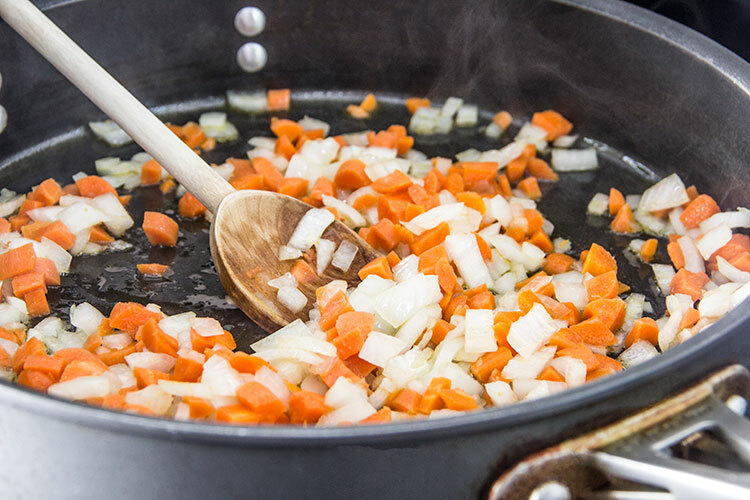 Add the chopped onion and carrots and cook until they’re softened. Add the mushrooms and chopped chickpeas and cook until they’re heated through. Then season everything with salt and pepper and add some garlic powder and some herbes de provence for lots of tasty flavor (substitute dried thyme and dried rosemary if you don’t have herbes de provence). If you’d like your sauce with just a hint of spiciness, also add a pinch of crushed red pepper flakes. Stir until everything is well combined, then add some red wine. Cook for a couple of minutes, until the wine has reduced and cooked down, then add tomato puree (or strained tomatoes). Stir everything until it’s well combined, and season thoroughly with salt and pepper. 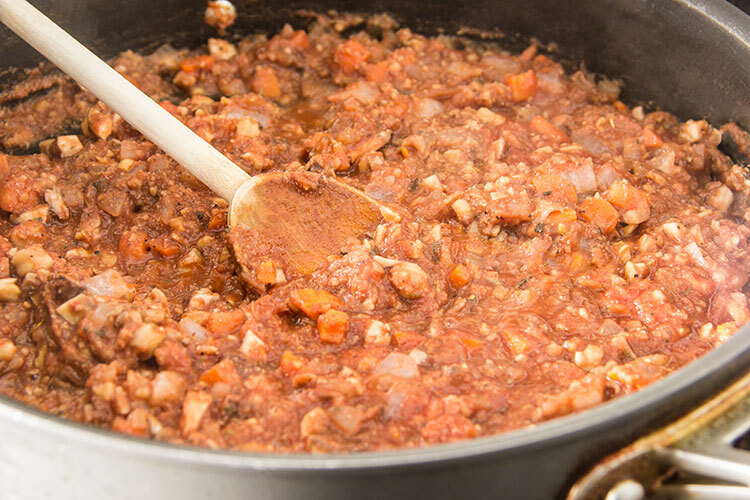 It looks just like a thick, hearty meat sauce, doesn’t it? It really warms the kitchen with the most delicious aroma too! Allow the sauce to simmer for a few minutes, then remove the pan from the heat and immediately stir in the cooked pasta. Then, if you’d like to add a fresh herb, chop up some fresh parsley to top off the pasta. This is such a comforting, heart-warming pasta dish! The chickpeas add lots of rich heartiness and the variety of veggies and seasonings add so much tasty flavor. 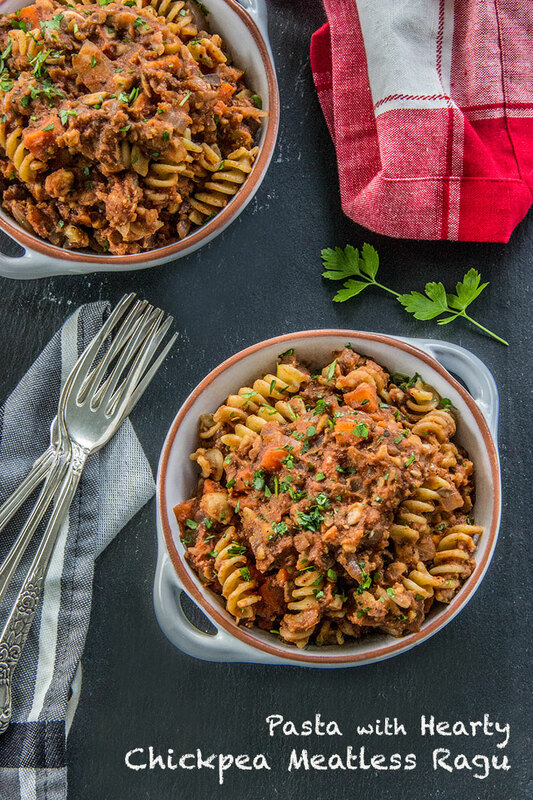 If you’re interested in trying more vegan or vegetable-based meals, I think this meatless ragù is a great place to start. If you’re anything like me, you won’t miss the meat at all! 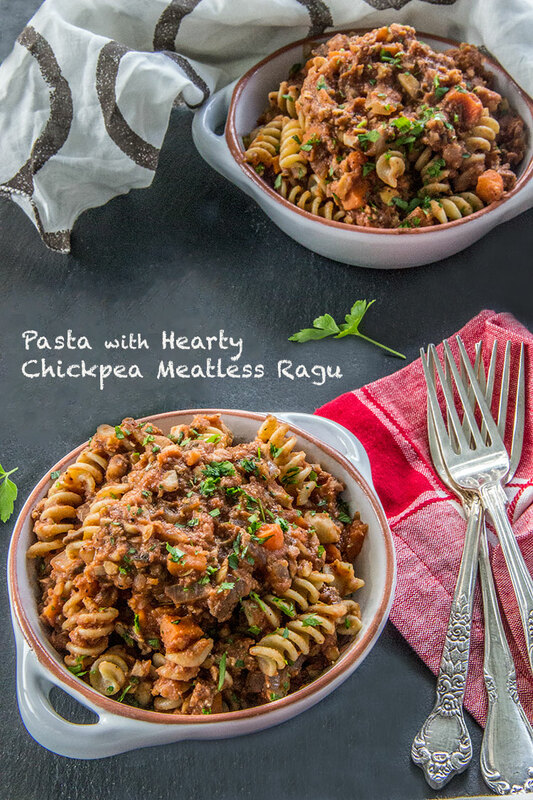 Chickpea ragu sounds amazing – I love chickpeas and using them in a ragu is genius!